Ever Ready First Aid 4'' Elastic Ace Type Bandage W/ Clips - Box of 10 by Ever Ready First Aid at Get Cheap Health Insurance. MPN: 0300030. Hurry! Limited time offer. Offer valid only while supplies last. EverReady's 4'' Elastic Bandage for wrapping. Rubber reinforced cotton bandage is lightweight and comfortable. Use to support strains and sprains. BEST BANDAGE FOR RECOVERY - Choosing a bandage that can provide high quality and professional grade care is important when selecting a bandage. Ever Ready First Aid bandages provide a unique combination of comfort and protection to promote recovery for your injury. EASY TO USE - Easily treat injuries such as sprains and strains by using these bandages to provide an even, stable pressure that will reduce and restrict swelling. Easily apply the bandage to any body part and apply it securely with our dual hook and loop system. Tighten and loosen the bandage as desired by adjusting the clips as desired. LATEX-FREE - Excellent for those with allergies or sensitivity to latex. These bandages are not made with latex unlike many other elastic bandages. 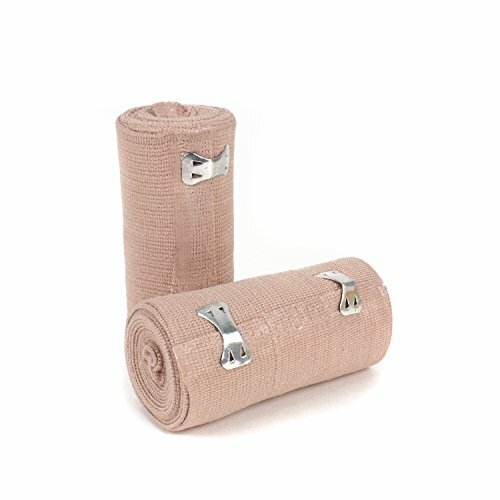 4" x 5 YARDS - Each bandage is 4" wide and unrolls to a full 5 yards, but is still compact when rolled up. Easily treat a variety of injuries on virtually any body part 5 yards of quality elastic bandage. Easy cut to fit the bandage or make use of it's length to wrap yourself more securely. BOX OF 10 INDIVIDUALLY BAGGED BANDAGES - Each bandage comes rolled up and packaged in a sealed poly bag, packed into a box of 10.